NuBot is a cross-platform automated trading bot written in java. NuBot is a tool that helps NuBits custodians to automate trades. As explained in the white paper, a custodian's core mission is to help maintain the peg while introducing new currency into the market. By using NuBot you declare to have accepted the afore-mentioned risks. See the DISCLAIMER.md for detailed terms. Custodians will use the trading bot and broadcast liquidity data to other Nu clients. Within the Nu system there are mainly two types of custodians: sell side and dual side custodians. Dual side custodians are custodians whose specific function is to provide liquidity for compensation, and they will initially only provide buy side price support. Once their buy order for NBT is partially filled, the bot then creates a sell order for that NBT. In the case of sell side custodians, the liquidity they provide is secondary to another goal such as funding core development, marketing NBT or distributing Peercoin dividends. They want to spend the proceeds of their NBT, so under no circumstance will they provide buy side liquidity. NuBot permits a user to indicate they are either a sell side or dual side custodian. This effect the trading bots behavior is detailed in the use cases below. First, someone who wishes to fulfill this role must seek shareholder approval via the custodial grant mechanism. Say a particular liquidity provider or LP custodian has 10 million USD he wishes to use to provide NuBit liquidity. He would expect compensation for lost opportunity cost (he could otherwise invest those funds in rental property, stocks or bonds) and for the risk of loss via an exchange default, such as we have seen with Mt. Gox and others. While the market will continually reprice this, let's say in our case the prospective LP custodian decides a 5% return every six months is fair compensation for lost opportunity cost and risk of exchange default. So, he promises shareholders to provide 10 million USD/NBT worth of liquidity for one year in exchange for 500,000 NBT. Shareholders approve this using the grant mechanism and he is granted 500,000 NBT. Now he must provide 10 million in liquidity constantly over the next year. He may do this through a single exchange or multiple exchanges. Let's say he does this with a single exchange. He opens an account with the exchange, then deposits $10 million worth of BTC and exchanges the BTC for USD. Now he is ready to make use of the trading bot. An appropriate exchange will expose a trading API and our trading bot implements the API for that specific exchange. Each implementation of a specific exchange API implements an interface to standardize the way the trading bot interacts with these diverse exchange APIs. Doing this will allow the LP custodian to enter authentication information into the trading bot for his exchange account. He will then use the user interface in our trading bot to place an buy order for 10,000,000 NBT on the exchange. The price will not be exactly one USD, it will be one USD minus the exchange transaction fee. If the exchange charges a 0.2% transaction fee, he will place a buy order for 10,000,000 NBT at a price of 0.998 USD. Let us suppose his order is partially filled in the amount of 1,000,000 NBT. Now his exchange account will contain 9,000,000 USD used to fund an order for 9,000,000 NBT. There will also be 1,000,000 NBT in the account. The trading bot automatically and immediately place these 1,000,000 NBT for sale at a price of 1.002 USD (one USD + a 0.2% transaction fee). If this order fills, then the bot should use the USD proceeds to immediately place a buy order for NBT at 0.998 USD. All funds should be continually on order and the LP custodian's funds should not be depleted by transaction fees. When an order is placed, canceled or filled (even partially), the liquidityinfo RPC method is called in the Nu client. See Attached Diagrams for a visual flowchart. In some cases custodians will spend the NuBits directly and not use the trading bot at all. For instance, if core developers accept NuBits as compensation then Jordan Lee will simply distribute NuBits granted to him directly without the need for any exchange. Let's examine the case where a 10,000,000 NBT custodial grant is given for the purpose of distributing a shareholder dividend in Peercoin. Such a custodian will deposit 10,000,000 NBT in a single or multiple exchanges. In our use case we will use a single exchange. 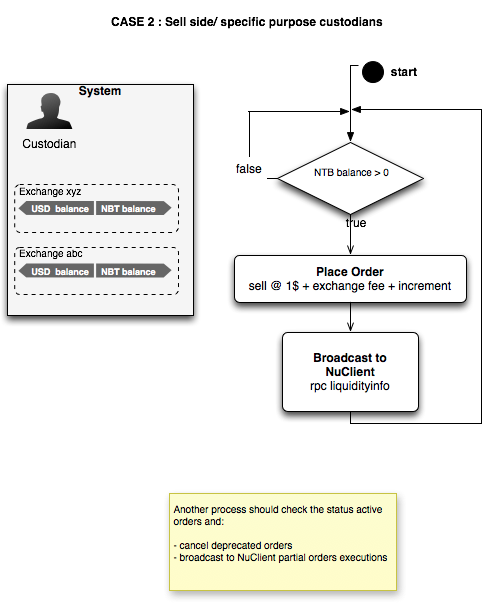 Once the NBT deposit is credited, the custodian will start the trading bot, indicate they are a sell side custodian and indicate that orders should be created, although nothing specific about the order should be entered by the user. The trading bot should offer the entire balance of NBT for sale using the formula of one USD + transaction fee + one pricing increment. Some exchanges allow the fee to be discovered through their API, while others do not. If the fee can be found through the API, it will. If not, the user should be asked to specify the transaction fee. Let's say our exchange has a transaction fee of 0.2% and supports 4 decimal places in its order book on the NBT/USD pair. Using our formula above, the trading bot would place an sell order for 10,000,000 NBT at a price of 1.0021. The reason it should be 1.0021 instead of 1.002 is that we want dual side sell orders to be executed first, so their funds can be returned to providing buy side liquidity. 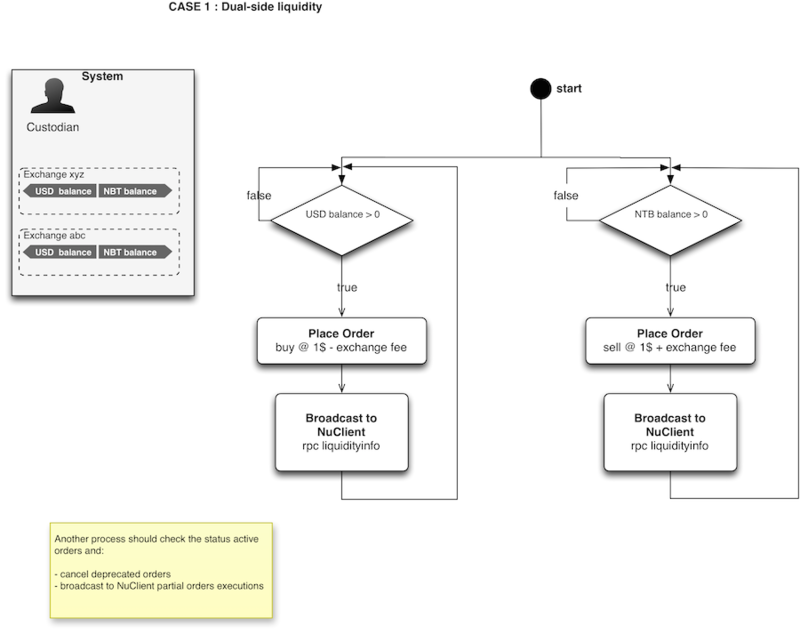 Each time an order is placed, cancelled or filled (even partially), the liquidityinfo Nu client RPC method is called. Details about this method can be found in the Liquidity Pool Tracking section. Calling liquidityinfo will have the effect of transmitting the size of the buy and sell liquidity pool the local trading bot is managing to all known Nu peers. There might be adjusted versions of the two strategies explained above. To request a custom build of NuBot to fulfil a particular custodial grant, get in touch. Alternative strategies : Secondary Peg Strategy : a strategy to let custodian trade of pairs different from NBT/USD . KTms Strategy : dual side Strategy with x% of proceeds from sales kept in balance. Link to KTm's custodial proposal . A motion was put forth by Jordan Lee on Nov 12th 2014 to help guide the development of liquidity operations for the Nu Network. The design calls for recognizing six tiers to the liquidity operations that support the NuBits $1 peg. Liquidity breakdown is displayed directly into the Nu client, or accessible via RPC commands getliquiditydetails <currency> and getliquidityinfo <currency>. This liquidity is immediately available, being on the order book at the best price (1$ +- fees and spread). It is used by NuBot to maintain the 1$ peg on exchanges, and it is also refered to as "wall". Tier1 liquidity will be replenished automatically after it stays at 10% of original wallSize for more than N minutes, defined in Settings.java . This liquidity sits on exchanges but is not usually placed on order books, or is placed on the orderbook at premium prices. To understand the details on how Tier2 liquidity is managed by NuBot, please refer to parametric orderbook documentation. It can be promoted to the order book (Tier 1) in a couple seconds. This liquidity sits off exchange and is held by liquidity providers in wallets not exposed to counterparty risk or the risk of NuBot malfunction. It can be promoted to tier 2 when needed in minutes. This liquidity can be provided by custodians not dedicated to liquidity operations. A present example are the proceeds of NuShare sales. They are intended for operational and development expenses, but can be used to support the critical function of liquidity provision as needed. When these funds are used for liquidity, they are exchanged from one type of asset to another, but are still available for their original purpose, such as development. These funds can be promoted to tier 3 in hours and the cost is exchange rate risk. This liquidity presents itself in a decentralized manner from the manipulation of interest rates (park rates). This liquidity is generally buy side, although technically it can be sell side in the case of lowering interest rates. This liquidity is available in days and the cost takes the form of interest paid. This liquidity takes the form of custodial grants for sell side and currency burning for buy side (presuming a currency burning motion is passed and implemented as appears likely). It takes a week or more to bring to market but has zero maintenance costs. The bot produces different output log files, all stored in special folders created for each session under logs/. NOTE: to avoid large files, html files gets rotated at 50MB. The log folder gets zipped at the end of each session to save disk space. Additional messages are logged to console if the option "verbosity"=high is set. Useful for debugging. For additional control over logging, the user can also manually edit the config/logging/logback.xml configuration file. In order for the bot to communicate with the exchanges API via encrypted https, it is necessary that the SSL certificate of the exchange is added to the local store of trusted certificates. NuBot includes the keystore file in its build. The Java JVM uses this keystore, an encrypted file which contains a file.jks with a collection of authorised certificates. Exchanges tend to upgrade their SSL certificates multiple times per year, and you need to maintain the keystore up-to-date for security reasons. We are committed to keep the java keystore always updated with most recent certificates available in the develop branch of this repository. Alternatively you can manually download the latest available download the most recent version from the repository: nubot_keystore.jks and place it in the res/ssl folder of NuBot.